Inger Marie waited for many years before she ventured upon a solo career, but she has ample experience from many years' activities in the music field. For twenty years she has been active as vocalist in several bands, ranging from a youthful rock band to a six year period as lead singer of a jazz big band. She has also fronted her own jazz quintet ?My Favoite Strings?, as well as collaborating with several excellent jazz musicans, among them Tom Lund, one of Norway's finest latin jazz-guitarists, founder of the renowned group ?Trio de Janeiro?. Having thus gathered a lot of experience and ?paid her dues?, Inger Marie finally decided to enter the studio to record her debut solo CD ?Make This Moment?. The time was right. Years of singing had matured her voice into an instrument of impressive sensitivity and perfection. Producer Lars Martin Myhre, himself a brilliant musician and a major artist in Norway, says that never has he got a bigger surprise than the one he got when Inger Marie started singing in the studio. She was displaying a voice so controlled, so beautiful and so personal at her first recording date, that the seasoned producer was left with his mouth open, stunned in admiration of the awareness and the warm and direct communication in her voice. ?Make This Moment? was released in Norway in October, 2004, and received rave reviews and instant recognition by jazz affectionados. After some months Inger Maries voice started touching hearts and impressing music lovers in places far from Norway. Japanese record buyers discovered her album, which started selling hundreds, then thousands in Japanese record stores. Record companies in Korea, The Phillipines, Hong Kong, and soon also Japan, licenced the album and launched local releases. Now the album has been released in most of Asia, as well as in Europe, and has touched the hearts and souls of thousands of listeners. Since the autumn of 2005, Inger Marie and her band have been performing concerts, playing festivals and participated in TV-shows and radio in various locations. Concerts and TV performances in Korea, and performances in Poland and Denmark have been highlights, as well as several succsessful performances at the ?Canal Street? Jazz Festival in her home town, Arendal. Inger Marie has been building up a solid relationship built on mutual respect with several musicians from the surprisingly high quality pool of musicans in an around her home town, and has hand piced the musicians for her band. They provide the exquisite backing on her recordings, as well as on stage. A special mention must be made of the fact that the impressive saxophone playing on the album comes from the horn of ?ivind G. St?mer, Inger Maries own son. He joined his mother's band after having played with some of the major musicans and artists in Norway. 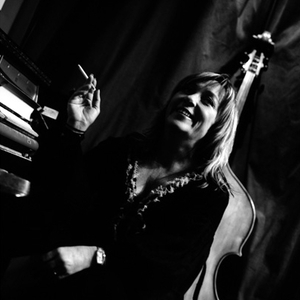 On her second album, ?By Myself?, Inger Marie chose to work with the renowned Danish producer S?ren Sigumfeldt. They recorded the album in Gothenburg, Sweden, still with Inger Marie's hand picked local Arendal musicans, but also inviting the Swedish guitar virtuoso Ulf Wakenius to the studio. Other guest performers include Gunnar Halle (trumpet) and Niclas Knudsen (electric guitar). The record has been released in most European countries by the Danish company Sundance, on the Stunt label. The album was first released in Norway by Inger Marie's original record company, Kultur & spetakkel, and the release was celebrated in grand style with a lavish release concert in Arendal's Culture House oct/07. "By myself" was very well received among critcs and fans.